Oxford University Press, USA, 9780190212247, 280pp. How Repentance Became Biblical tells the story of repentance as a concept. Many today, in both secular and religious contexts, assume it to be a natural and inevitable component of our lives. But, where did it originate? How did it become so prominent within Western religious traditions and, by extension, contemporary culture? What purposes does it serve? The book identifies repentance as a product of the Hellenistic period, where it was taken up within emerging forms of Judaism and Christianity as a mode of subjective control. It argues that, along with the rise of repentance, a series of interpretive practices, many of which remain in effect to this day, was put into place whereby repentance is read into the Bible and the Bible, especially the Hebrew Bible, or Old Testament, comes to be seen as repentance's source. Ancient Israelite rituals, such as fasting, prayer, and confession, all of which are incorporated later on within various religious communities as forms of penitential discipline, are understood as external signs of internal remorse. Hebrew terms and phrases, such as the prophetic injunction to "return to YHWH," are read as ancient representations of the concept, repentance. Prophetic literature as a whole is seen as serving a pedagogical purpose, as aiming at the reformation of Israel as a nation. Furthermore, it is assumed that, on the basis of the Bible, sectarians living in the late Second Temple period, from the Dead Sea sect to the early Jesus movement, believed that their redemption depended upon their repentance. In fact, the penitential framework within which the Bible is interpreted tells us the most about our own interpretive tendencies, about how we privilege notions of interiority, autonomy, and virtue. The book develops other frameworks for explaining the biblical phenomena in their ancient contexts, based on alternative views of the body, power, speech, and the divine, and, thereby, offers a new account of repentance's origins. 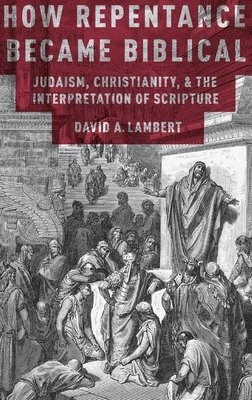 David Lambert is an associate professor of Religious Studies at the University of North Carolina at Chapel Hill, where he teaches courses on the Hebrew Bible and its history of interpretation. He received his undergraduate and graduate training at Harvard University in the Department of Near Eastern Languages and Civilizations.